works with painting, animation and installation. He seeks for unpleasant, pleasant, absurd and noteworthy aspects of life. Hoping to find the meaning of life by accident while having fun. I have been working with installations since early 1980s. Evolution of the human mind, especially the interconnectedness of matter and mind and the emergent properties connected to this, are the important constituents of my studies, and can be seen as allegorical reflections in my work. The postmodern research on cognition and perceiving and our actions in the world has a relevant part in the ideas behind my working. I´m wondering how we effect our world by perceiving it, experiencing it and living it. This is what I mean with the expression “matter and mind“. For where does the mind end and the “world” begin? For me the world is not a given place outside us, my approach is phenomenological; the world unfolds in correlation with our own cultural and mental development, with our broadening cognition and knowledge. This is an interdependent and ongoing process. My installations are allegorical reflections on this exploration. My art is space-specific. I’m often assembling my installations to fill several rooms, so that the subject matter can be sensed through the connotations of the combined materials, form, and thought. Some of the materials I use have a transient character, like water, breeze, light, grease, and pigment powders. But also stones, steel, glass and other reflecting materials are often parts of the installations. I prefer to create installations in which beauty combines with austerity, meaning and thought. My installation at the Toolbox is called My Mental Hadron-Collider. It is a small videoinstallation. The work is an ecological statement of the ongoing human fall on this planet. It consists of a text, videoprojection into the material installation. The text can be read in the introduction of the installation. Alisa Javits works in Helsinki with video and installation. She mixes photographic and filmic working methods. The main theme of the work is the contradiction between the inner and the outer in people. I ́m graduated from the University of Applied Sciences, Institute of Fine Arts Lahti. I also hold a masters degree in social sciences. With this combination as a background it ́s somewhat natural to explore “the social” by the means of arts. The theme ”street” is one cornerstone of my artwork. The artworks have been painted based on classical traditions. The combination creates an interesting tension between the traditional techniques and the modern themes, where “the social“ meets “the realism“. When these marginalized people are brought into the gallery, we are forced to face something we would prefer rather not to see or to think about. It is fascinating, how art can make a powerful statement about social issues. Yet the process itself is crucially slow. The situations evolve rather slowly on a canvas or on a piece of paper and an true, deeper dialogue among the painting and the world is not possible. In the end the piece remains as the artist ́s statement towards a certain issue but reproduces itself due the perception of the viewer. I make three-dimensional works and installations, which are composed of numerous parts. In my works I also combine different ways of depicting: two- and three-dimensional parts can form a single piece of work. In my artistic practice I am interested in for instance how to use one material to make an illusion of another material. 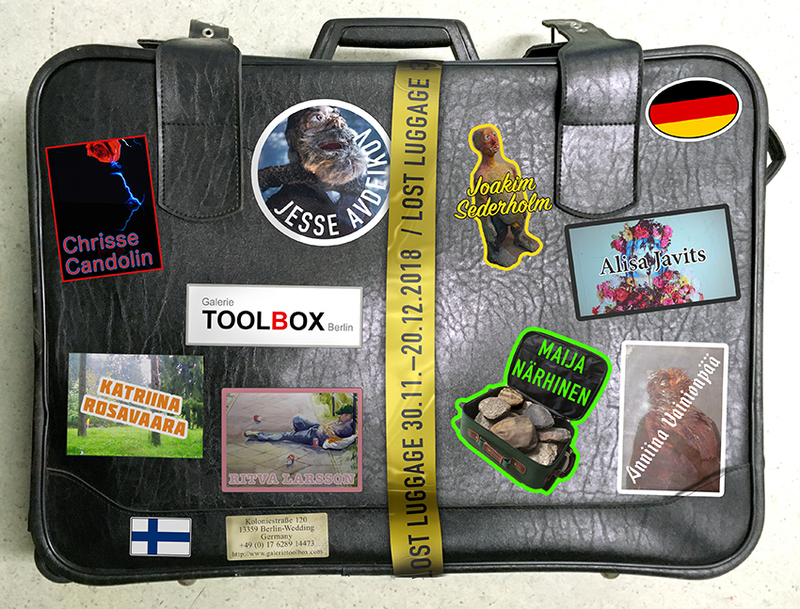 In the Lost Luggage exhibition there will be my work called Luggage. 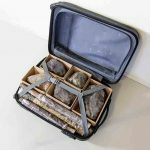 It consists of easily movable stones: the stones packed in a suitcase have been made of water colour paintings on paper. Some of them are in a form of a paper roll and some of them have been formed to resemble real stones. Katriina Rosavaara (b. 1975, Finland) is Helsinki based visual artist. Lost Landscape – Revisited (2018) is a short film essay on family history, transgenerational war trauma, refugee and queer. Rosavaaras grandparents were forced to leave their home during the second world war. In the film Rosavaara travels back to her former family home town Sortavala (Russia) three times, in three different decades, reflecting changes on her own memories and on Sortavala city area. The subject of my recent work has been memory and personal history combined with how our individual experiences resemble one another and unify us despite our different backgrounds. In my work I often depict aspects of humanity such as feeling of disparity and alienation. According to my personal experiences concepts of safe and familiar can transform (for example due to illness) into something strange and unrecognisable even terrifying. The works represented at Lost Luggage exhibition are from “Oblivion” series. They are combinations of woodcut and monotype on paper.